No story of the NES would be complete without mentioning the fat, stubby plumber Mario and his tall, lanky sibling sidekick Luigi. The first entry of the Mario franchise, Super Mario Bros., was the NES’s launch title in 1985. 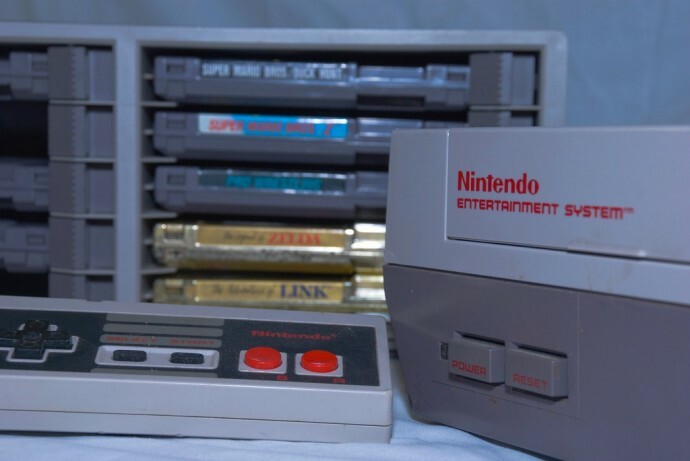 It established the side-scrolling platform as the most popular gaming format for home consoles. However, it was the sequel, 1990’s Super Mario Bros. 3, that refined the original’s gameplay with multi-layered levels and confirmed Mario as Nintendo’s video game mascot. Both 1 and 3 are two of the best-selling video games of all time. Released by Tecmo in 1988, Ninja Gaiden was a martial arts-based, action-adventure game. It gained popularity for its catchy musical soundtrack, and for being the first home console game to present its story with cinematic cut scenes. Ninja Gaiden is also notorious among gamers for its punishing yet thrilling difficulty, no thanks to its multitude of enemies, brutal bosses, and tight action-platform style of gameplay. Originally an arcade game, Konami’s Contra had its NES debut in 1988. Addictive in its trigger-happy two-player simultaneous mode and action-epic feel, it popularized the run-and-gun gaming format in the industry. Like the Mario games, the Zelda franchise was developed by Nintendo. It began with the 1986 release of The Legend of Zelda. The game is set in the fantasy land of Hyrule and involves a boy named Link who is on a quest to rescue the titular character. Zelda is credited for spawning the role-playing game (RPG) variant. Like the aforementioned Mario and Zelda franchises, Metroid was also developed by Nintendo. Unlike those two, however, the game, including the 1986 original for the NES, has a female protagonist, which was quite uncommon at the time. Metroid is also notable for being a pioneer of maze-like, non-linear gameplay. In 1986, 1987, and 1990, Konami published a trio of games that mixed elements of dark fantasy, horror cinema, and medieval life. Centered on a clan of vampire hunters, the games were popular for their hash-and-slash combat style, gothic music, and semi-nonlinear gameplay. Castlevania and Castlevania III: Dracula’s Curse stick to the side-scrolling platform format, while Castlevania II: Simon’s Quest is notable for a brief detour in the series with its non-linear, RPG presentation. Square Enix released the 1987 original as a last-ditch effort to save itself. It turned out to be a game that revolutionized the RPG market with its multiple game modes, outstanding graphics, well-developed storyline, and spontaneous battles. Capcom’s Mega Man franchise features an android that absorbs the specialized powers of the Robot Master he defeats at the end of each level. Although Capcom developed six entries for the NES, the second and third installments, Mega Man 2 and Mega Man 3, respectively, are widely considered to comprise the pinnacle of the series for their memorable soundtracks, challenging gameplay, innovative bosses, and accompanying powers. Daryl Brett is a freelance writer based in Boulder, CO. Along with video games, Daryl is fascinated by MTG cards, strategy games, board games, computer games, movie trivia, geek conventions and other relevant topics. Curious readers should visit card kingdom for more information. Image credit goes to acesmoke.